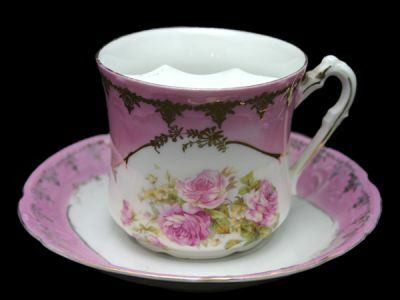 Lush pink roses are featured surrounded by blush glaze and hand gilded patterning on this Victorian moustache cup. Ornate handle loop is designed with a rest and kink and the saucer with a subtle scallop. In good condition, with some wear of the gilding along the rim of the cup.